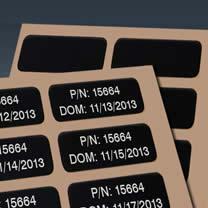 Why Choose MPC's DuraBlack Blank Labels & Tags? .005" or .020" anodized aluminum face stock. 15 working days from receipt of order and approval of artwork. Expedited shipment is available for an additional charge. Foil thickness requires 15-20 working days.